Dell is living through tough times in its history. Since last year capitalization had dropped by more than 40%, because of relatively low sales growth of PC (the basis of Dell’s business). In this conditions Dell’s management has to undertake unusual steps. Well, recently Dell has announced the cooperation with AMD, the fact encouraged Dell shares at once. This was just the first step. The company sees the traditional PDA market as an optional direction, not a priority. Handheld computers by Dell can be developed under several scenarios. The first scenario – the company sees no prospects on the PDA market and leaves it to spare costs. 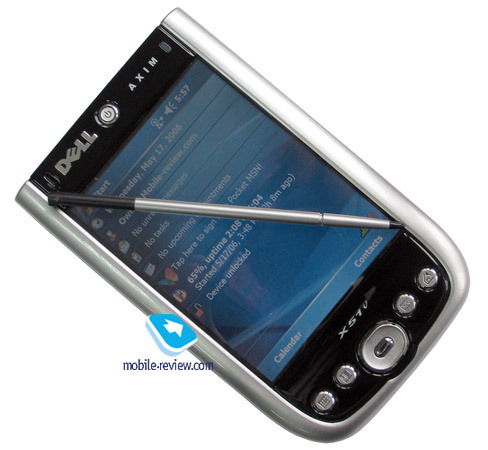 As a matter of fact, in April there were heated discussions and rumors in the Internet about Dell leaving the PDA market (discussions were activated by the message from pdalive.com). The second scenario – the company switches to communicators and smartphones from traditional PDAs. We think this is more realistic scenario in conditions when the management undertakes great steps to restore capitalization. The third scenario – the company keeps on releasing traditional PDAs. This is the least possible way, we think. 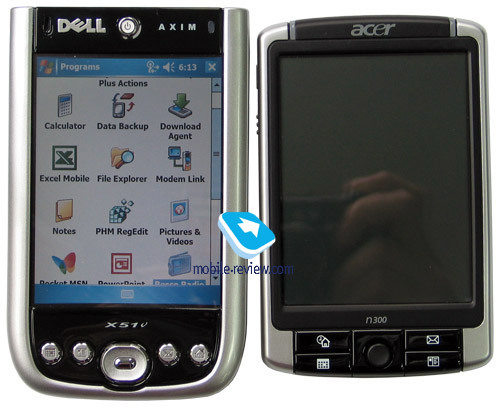 Remember, the model line hasn’t been updated more than 1.5 years (Dell Axim X50 was released in October 2004). Today we tell you about the device, which is an update of the old handheld, but not a complete substitute. Before we pass to the review, we’d mark distinctive features of the new model. Design and appearance haven’t been changed, except for new “1” on the shell. As for the hardware, Dell X51v is equipped with a new flash-memory module with twice as much capacity. Main changes concern software: new Windows Mobile version, replaced Bluetooth drivers. That’s all for the changes. As Dell X50v and Dell X51v are almost the twins, we resume many parts of the Dell X50v review. 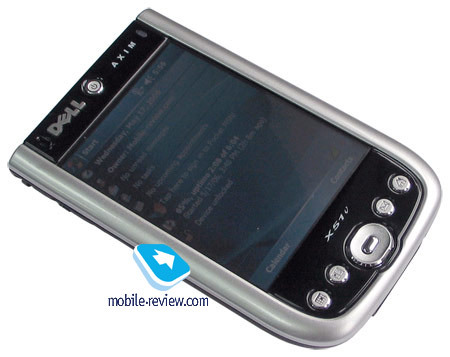 Dell started its history on the PDA market with the model Dell Axim X5, which became the bestseller due to the low price and acceptable functionality, even despite of the large size of the device. In many respects this very model made many PDA makers to lower prices. Then there appear a single-slot wireless solution Dell Axim X3, later on - Dell Axim X30. They also played the role in the pricing, however a less significant one compared with Dell Axim X5. When Pocket PC with VGA-screens came to the market, the prices for Hi-End Pocket PC soared by $150-200. It seemed that the prices of the past came back. 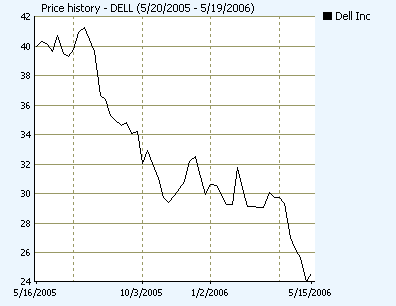 With the appearance of the X50 Dell hit prices on Pocket PC making other manufacturers adjust their offer. As the price dumping was limited by the US market, vendors lowered prices though, but slightly and very slowly. In Europe main competitive devices were offered at comparable prices. Before the market entrance Dell had been looking long for a contractor, which could make large amount of PDA at ultra low costs. Eventually they found the Taiwanese company Wistron. Later Dell refused Wistron services, Dell X50/X1 are produced by the other company, the Taiwanese HTC. Currently the situation is the same, almost all “top” Pocket PC models are made by HTC (except for Acer n300). 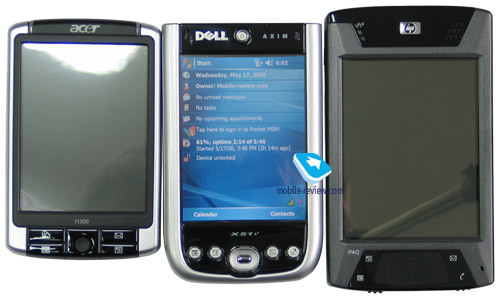 The Dell Axim X51 series consists of three handhelds. The X51v; Dell X51 520 MHz –with a QVGA-LCD, lower clock rate, lower price, less internal memory size; Dell X51 416 MHz – more lower price, lower clock rate, the lack of the Wi-Fi module. The mid and junior modifications belong to mid-range class, they rival with HP iPaq hx2000 series, this is the only direct competitor. These models will be interesting for those who need PDA functionality and do not care much about screen resolution and Wi-Fi module. We started our tests and noticed at once the first shortcoming - with the joystick and application buttons. They have no delay when pressed like in FS Pocket LOOX 720 (this problem in the LOOX was solved by an exterior utility), but they are too small, so they aren’t good while playing arcade games, which involve application buttons. If you place your thumb at the joystick and the other thumb at the button nearby, they will catch each other and interfere, besides you can accidentally push the action button located in the middle of the joystick. However you can get accustomed to it. Naturally I had no problems with the control buttons in ordinary applications. On the left there are a hole for the wrist strap, a hold slider to block buttons, a voice recorder button and a Wi-Fi button. You can reassign all the buttons, however just for a single action or application, strange, with standard means it’s impossible to program several functions for a button (only with exterior utilities). On the top you find two expansion slots, IrDA port, standard audio jack (with a wire or wireless headset it’s possible to use the PDA as the IP-phone). The sound in the headphones turned to be not that loud as in HP iPaq hx4700, subjectively it’s a little bit worse, more flat, however you can level it out with some equalizer settings. Above the screen a power button is located, it also serves as a battery indicator (constantly glowing orange when the battery is almost drained out). To the top right is a wireless networking indicator. To the left – a microphone (a hole with the microphone icon). The recording quality of the microphone is average, worse than in FS Pocket LOOX 720, but comparable with Asus A730. At the bottom there is only a synchronization connector, so you can plug a docking station or a synchronization cable. There are two ways to charge the device: directly or via the docking station, that’s become standard. The back panel hides the battery compartment and the reset button. Some words about the cradle, it’s an ordinary one, black color, nothing special. However it has a slot to charge a spare battery. Like almost all new handhelds this PDA lacks the camera. We can assert the built-in camera proved to be unviable in PDA. New “top” Pocket PC models stand out with 640x480 pixel screens. As it was forecasted handheld computers with such screens become gradually common feature. In quality the screen of Dell X50v is comparable with that of Acer n311, Asus A730. The diagonal is 3.7” long (56x75 mm). There is no wonder, both of them are produced by Sharp under CG-Silicon technology. As for viewing angles, color rendering the Dell screen loses to FS Pocket LOOX C550/N560, HP iPaq hx4700. The lowest backlight level is sufficient to work with the handheld in the dark, however it lags behind HP iPaq hx4700 greatly. The screen displays 65K colors. In all, the quality of the screen is at a good average level. The PDA carries a Li-Ion 1100 mAh battery onboard. This is the minimal figure compared to the rivals. Remember that Dell X50v suffered from short battery life. Due to new memory organization in Windows Mobile 5.0 battery life has increased and doesn’t seem a serious flaw against its competitors. Under the maximum load (the highest backlight level and clock rate, video playback) the PDA worked for 1 hour 55 minutes. 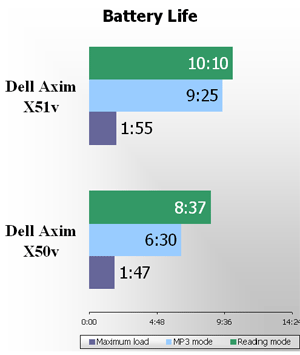 In the read mode (the second backlight level, the lowest clock rate) Dell X51v lasted for 10 hours 10 minutes. In the MP3-player mode (the screen off, the lowest clock rate, playback from the storage card) the device was good for 9 hours 25 minutes, much longer compared to Dell X50v. It’s possible to double battery life, if you buy an extra battery capacious of 2200 mAh. I’d note there are batteries with even higher capacity. I’d also mark a good optimization for Wi-Fi work – after 3 hours of listening to the Internet-radio connected via a hot spot (the screen off, the lowest clock rate) the battery drained to 50%. Top Pocket PC models feature the following: a dual extension slot – Compact Flash Type II and SD/MMC (SDIO), two wireless adapters – Wi-Fi and Bluetooth, a VGA-screen. Gradually the above-mentioned wireless adapters have become typical not only for top models, but also for mid-range and low-end handhelds. Step by step we pay less attention to them, as they become the integral part like the infrared port (though there appear models without an infrared port). You might have noticed we haven’t mentioned GPS- and 3G/GSM-modules, with them a PDA belongs to another category. The situation with extension slots is more difficult. 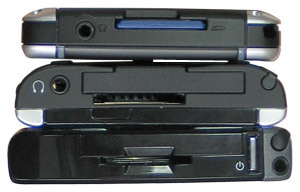 All handheld computers can be divided into single slot (respectively small dimensions, a single SD/MMC slot) and dual slot (larger dimensions, SD/MMC and CF slots) devices. Before the appearance of Acer n311 high-end Pocket PCs have belonged to the dual slot category. What kind of peculiarities we can face with dealing with interfaces, and should we focus on them? We’ll try to find out it in brief. Compact Flash Type II. Customary it is marked CF. Frankly speaking CF slot has two options – either there is one or there is none. Dell Axim X5 had the problem – its slot was too deep inside, so some CF peripherals simply didn’t reach the contacts. Dell X50v/ X51v don’t suffer from it. Officially Dell X50v/X51v don’t support Microdrive cards (with the voltage – 3.3v, instead of 5v required by the hard disk drive), but they still do work. However there are some problems (they work slowly and not always). Usually CF slot is the criterion to buy in the following cases: cheap memory of large size, a digital camera with CF slot, the need to copy large-size info from one card to another, rarely – the need of the simultaneous use of CF slot for peripherals and SD for memory (for example, for GPS). Secure Digital/ MultiMedia Card (SD/MMC). For a long time there have been 4GB cards of this format on the market, and soon we’ll see 8GB cards. The slot supports SDIO (SD Input/Out), i.e. you can plug peripheral devices. Dell X50v comes with SDIO support, but I think the slot is located too deep inside. This means there might be problems like in Dell X5 with CF slot – some peripherals won’t access the contacts, however we didn’t face with this problem. In all, following the appearance of larger-size SD cards, price cuts and emergence of non-expensive SDIO-equipment, CF slot will be less popular. Many Pocket PC users postpone the purchase of a new VGA PDA expecting a single-slot handheld with smaller dimensions. USB, Serial. Theoretically all new PDA support USB-host (the opportunity to plug other devices, for example, a keyboard or a HDD-USB drive) at the plate level (processor, graphical accelerator), but not all models have a host led to the connector contacts. In this aspect Dell X51v doesn’t support USB-host, but it can be charged via USB (when the PDA is off) like other VGA Pocket PC (Asus A730, HP iPaq hx4700). New Dell model supports TTL Serial (not complete RS232). With Card Export II program you can use the handheld as a card-reader, copy files without installing Active Sync. IrDA. An infrared port can differ in speed: Slow Infrared (SIR, 115 kbps), Fast Infrared (FIR, 4 mbps). There is also Consumer Infrared (CIR) that features long distance effect, it can control remotely home appliances. We won't go into details, just tell you that there is no PDA with full CIR support, only SIR or FIR with different signal power. That's why you can use them as a remote control, the maximum active distance varies from 20-30 cm to 10 m depending on the chip. The Dell handheld works at some 4-5 m distance as a remote control. The IrDA window is conveniently located to operate home appliances. Bluetooth. The devices supporting Bluetooth 2.0 standard are already available, however we still have to be satisfied with Bluetooth 1.1 and Bluetooth 1.2 in the PDA. As for the software for Bluetooth, the manufacturer has two ways. It can license Broadcom software or use Bluetooth support integrated into WM 5.0. Alas, manufacturers gradually switch from Broadcom drivers to built-in stack, which affects functionality. Unlike Dell X50v Dell X51v has built-in drivers. I’d note that some skilled specialists adjusted Broadcom stack to Dell X51v, which works not bad, however such modifications aren’t official or legal. Wi-Fi (IEEE 802.11b). Dell X51v supports 802.11b standard. At the moment PDAs supporting g version are already available. Don’t treat it as a shortcoming. Is there the need for such speed? – The matter is being discussed, but manufacturers gradually cut production of b chipsets shifting to g ones (this relates first of to the hot spots, different adapters for PC and notebooks). Thus, sooner or later PDAs will be switched to g, as it is dually compatible with b. Dell X51v has good sensitivity of a Wi-Fi signal, and it supports Wi-Fi Protected Access (WPA) security standard, which is considered to be safe compared to vulnerable WEP standard. You can use the handheld as the IP-phone talking on it by wire (the standard 2.5 mm headset with the 2.5-3.5 mm adapter, not included in the standard kit) or wireless means. With additional adapter (it costs about $50) it’s possible to display the picture on an external LCD and a 1024x768 pixels projector. The Presentation Bundle also contains ClearVue package еще view PDF documents and MS Office files. It’s a great advantage, if you want to make mobile presentations. Well, we’ve done with the story about interfaces. There is 49.47 MB RAM available to the user (against 61.78 MB in Dell X50v). That’s enough to cope with almost any task for PDA. You should install programs to the storage card or to flash-memory, 195 MB of which is available to the user. Larger built-in flash memory size is one of the main distinctions in the new PDA. The CPU is Intel XScale PXA270 624 MHz processor, the same as in HP iPaq hx4700 (FS and Asus have other modification - PXA272 with the highest standard clock rate - 520 MHz). The PXA270 processor differs from the PXA272 in higher clock rate and it lacks Intel StrataFlash. We’ll talk in details about productivity in our comparative review of Hi-End Pocket PC. Here let’s speak about built-in accelerator 2700G. Dell X50v was the first handheld with the integrated accelerator 2700G, it seemed to become the mass one. However that didn’t happen. Till now this accelerator is built in only in the X50v/X51v among PDAs. Since the beginning this graphical accelerator had a difficult destiny – the Dell model showed minimum performance in synthetic tests. In non-optimized video players too (till the release of the handheld) the situation wasn’t better. Naturally everybody was surprised and disappointed. Well, to the scene comes Intel, which explains results by synthetic test packages (see the full test here). The essence is that, currently applications (including graphical test packages) and games do not use high-level API (Application programming interface) such as GDI , OpenGL ES and Direct3D Mobile, so you have to optimize applications to a certain hardware (ATI Imageon, Intel 2700G). That means, soon before the switch to high-level API applications and games will be divided into two camps: one will support graphical accelerators and the other won't. This process is familiar to the computer industry, remember first graphical accelerators for PC, when games were specially adapted to 3Dfx. The same way will follow handheld computers, probably the process will take less time, but not an instant. Alas, though the process went on, the general situation hasn’t changed much. Three games optimized to Intel 2700G, optionally supplied with Dell X51v. The impression was like the first meeting with 3Dfx many years ago: quick, beautiful, uncustomary. Even the graphics level is almost the same, as long ago with 3D acceleration on home PC. Tony Hawk's Pro Skater 2. It’s the port of the popular 3D game about skateboarding. 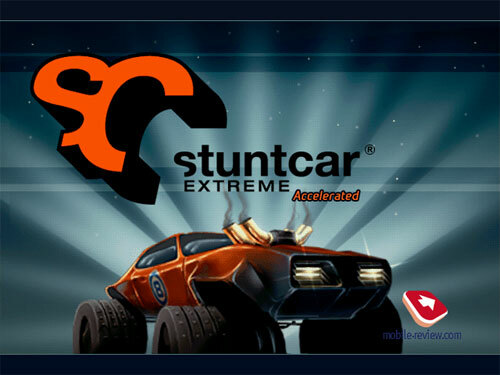 Stuntcar Extreme. It’s an extreme 3D race. Along with graphics the game stands out for the multi-player support via Wi-Fi. 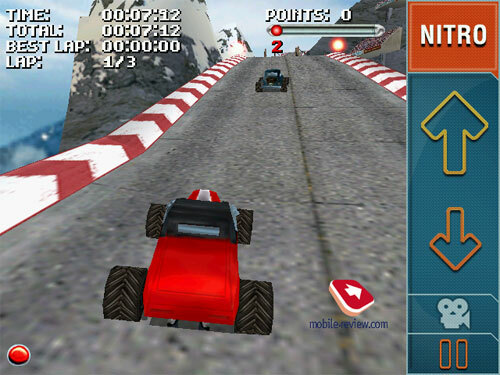 You can operate your car with the joystick and the touch-screen. Enigmo. 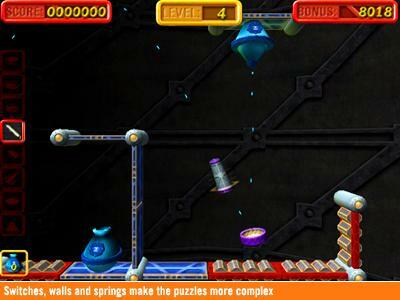 This is a pseudo 3D nice quiz in the style if the old The Incredible Machine. 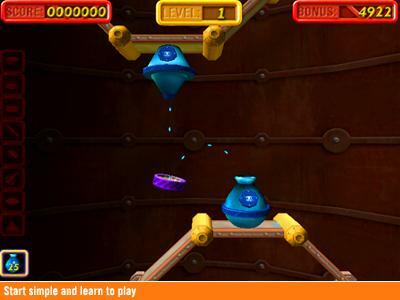 Using different tools you have to deliver jumping balls from one vessel to another. It’s possible to build custom levels. The game is nice and fascinating. Beside these 3 games there aren’t many games optimized to 2700G: optimized PocketSNES emulator (the way to plenty of SNES games), 3D Chopper Fight, GeoRally EX, Quake Mobile 1.2, Quake 3, space shooter Solterra. That’s all, I hope I haven’t missed anything. We can add Cube too, but this is a 3D engine, not a full featured game. Hardware acceleration is supported by 2 program video players. TCPMP. The best media player has got the support of Intel 2700G almost right after the release of Dell X50v. It revealed its potential at once, outpacing in speed ATI accelerator integrated to HP iPaq hx4700, which used to be the leader with video playback speed. To say the truth, the speed higher than 120% at the heaviest clip is excessive. The major advantage isn’t related to video processing speed (CPU without the graphical accelerator can ensure the normal video playback), but to the fact that it’s possible to lower CPU speed by shifting video decoding to the graphical accelerator and thus increase battery life of the device. Hardware video decoding also supports Windows Media Player 10. 2700G accelerator won’t become the standard and soon be replaced by the new generation of accelerators. It turns out that we have the minimal set of adjusted games, they are good to demonstrate opportunities. The users oriented at video and games will choose better Sony PSP than the Dell handheld. The PDA is powered by Windows Mobile 5.0. You can read about it in the respective review on our site. Remember, the main changes in the new OS are focused on better work of Windows Mobile communicators, there are little improvements for an ordinary PDA – new organization of memory (the data won’t be lost at the strong discharge), improved Mobile Office. The set of preinstalled programs remained the same, the poor one. Dell X51v is an update of the previous model. Main changes are double flash-memory capacity, new Windows Mobile version, replaced Bluetooth drivers. Positively, battery life got longer due to new memory organization in WM 5.0. In other aspects we have the familiar Dell X50v. This time Dell hasn’t initiated a price revolution, the device costs $500 without discount in the US. The situation is witness in Europe, the current price in Moscow varies from $470 to $500. Taking into account the price/quality ratio Acer n311 looks more attractive, you’d better choose the Dell model, if you need high productivity in video and games and work with Wi-Fi much. Earlier we highlighted short battery life as the main shortcoming, and now it is the high price ($500 greatly exceeds the price of Acer n311 and the new HP iPaq hx4700). We are thankful to DiFo for the equipment provided for tests.